August 15 It cleared last night. I unzip my tent door and look out to see the morning sun sparkling on the first frost of fall. For the second day I’m trying to locate a route to running water and the Johnson River, once part of the old Yukon-Kuskowkim Portage, now long abandoned. While exploring the edge of the lake I camped on last night, I find a channel to a different arm of the lake. Just when it looks like there is no outlet, I spot a detectable ripple of current. I follow it through the waving grass and floating bog and over lily pads. I repeatedly lose the current before locating it again. The topographic map is visible on my iPhone although it’s GPS isn’t working. Today my stand-alone GPS is working just enough (no zoom, sporadic location plotting) so I can figure out where I am on my iPhone map. I paddle through a series of lakes and swamp flats, often getting out to drag, sometimes for long, tiring distances. It would make a big difference if I knew I’d end up making it through, but I don’t. The thought of having to do this all in reverse is unpleasant. Today’s sun, though, makes a big difference for morale and in keeping my directions straight, and the sunshine is beautiful on the enormous white swans. After hours of struggle the general direction of the slight current is heading southwest, and I’m hopeful that when it reaches the plotted course of the original channel it will become a real river. When I reach that point, I climb a little hill, hoping to see the river, but I see nothing but more swamp, for miles. This is not good. I follow a slight ripple of current until it hits a mat of floating vegetation that stops me. When I get out to drag it’s too deep to stand up. Half in and half out of the kayak I flounder until I get to floatable water again. And so it goes. Eventually I notice that I’ve been paddling for nearly a mile without having to drag. I’m afraid to admit it to myself for fear I’ll jinx it. Each time it seems the channel is going to close off I come around a corner and see more open water. And the current seems to be getting a bit stronger as well. I’m still having to get out now and then, and backtrack here and there, but things are getting better. It now feels like I’m actually on a creek flowing through a big swamp. There is more beaver sign, chewed sticks and stumps. In fact, nearly all of the few nearby trees and most brush near the water has been chewed down. I frequently flush sandhill cranes. 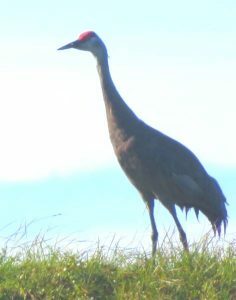 A pair are standing in the tall grass right near the water. I ready my camera for a shot, but for some reason they don’t flush. When I round the corner I see why, an enormous fluffy chick is frantically running along the water. He jumps in. He looks like he’d sink like a rock but he floats and paddles into the grass, back towards his parents. The current follows endless loops, slowing my forward progress, but I’m so happy to be paddling I don’t mind. I see a cow and calf moose, and then a bull. I stop for lunch on a dry tundra knob. I spread out all my gear and walk around picking blueberries while everything dries in the warm, glorious sunshine. I’m nearing the confluence of the next segment of the portage, Crooked Creek. 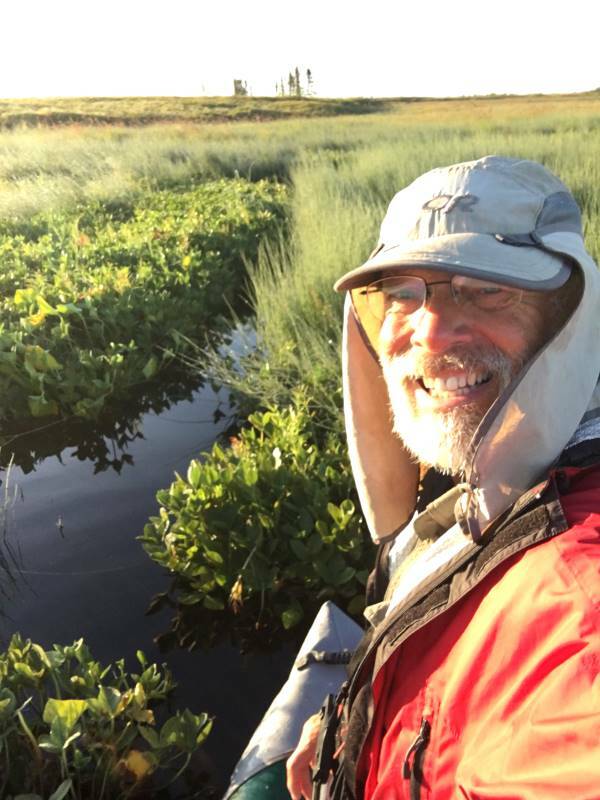 The name suggests it will have even less water than this “river.” If so, paddling the Johnson River all the way to the Kuskokwim might make sense. The downside is that the countless loops will add days to the journey, probably why it wasn’t part of the portage a hundred years ago. I’m getting concerned that I won’t be able to find the mouth of Crooked Creek when I spot it. It’s a pleasant surprise. Crooked Creek must three times as big as this “river”, with a substantial current, and muddy rather than clear. The current will add to the work of paddling up it, but no matter, I have navigable water. I land the kayak and find a good campsite at the base of a little hill at the confluence. Undoubtedly native peoples have camped here for centuries. I set up camp in the warm sun, hanging everything to finish drying. I walk down to the confluence fully expecting to catch a fish, but no strikes. What a different world from yesterday evening. I solved the mystery of the Johnson River, and I know Crooked Creek is navigable. I’m warm and dry and fully confident once again. The key to success is not giving up. August 16 It’s foggy and damp this morning. Last night I could hear a beaver sniffing and splashing around in the shallow water near my tent. He slapped his tail on the water countless times during the night. Paddling up Crooked Creek is not a significant problem, although there are many winding bends. There are many small lakes and countless ducks along the way. A family of otters is playing in the river. 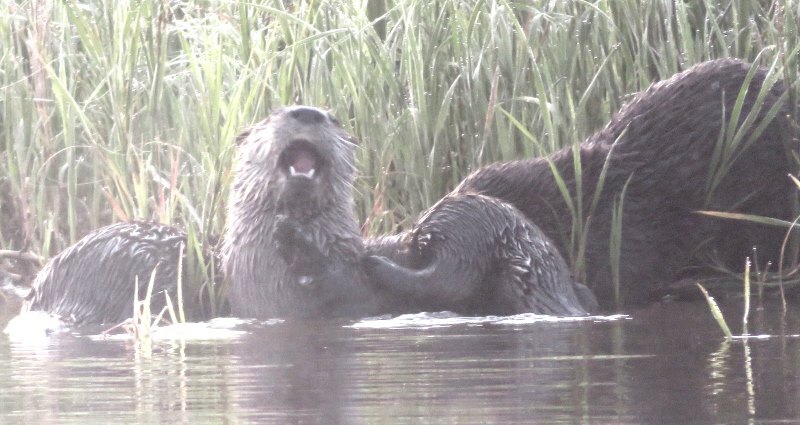 When I get too close the mother swims between my kayak and her young, growling. There’s a weather-bleached moose skull with an enormous set of antlers along the river. A bit farther I follow a path in the grass up a hill to find a recently used duck hunter’s camp! I am really surprised. There must be a good route to this point from nearby Kalskag. It’s late afternoon and I’m watching for where I leave Crooked Creek for a nearby lake. I am delighted to find an open channel that jet boats have been using. What would have been yet another tough slog through bog is an easy paddle. Yes! I paddle across the lake, expecting to find a path to Mud Creek on the other side. Or maybe there’s even a water route to Mud Creek? Unfortunately after searching around I find neither. The jet boats must be just hunting this lake, and getting to Crooked Creek another way. What I do find is an old gas can tied to an old paddle sticking out of the lake shore. It must mark the old portage route. 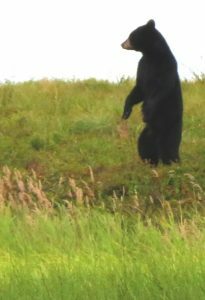 As I paddle towards it a black bear comes patrolling along the shore. When he sees me he stands up to investigate, then runs. 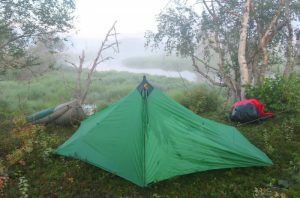 For what I hope is the last time I flounder my way through a swamp to high ground, where I start packing up my gear for what should be about a one mile portage to Mud Creek. Suddenly an unpleasant thought strikes me. 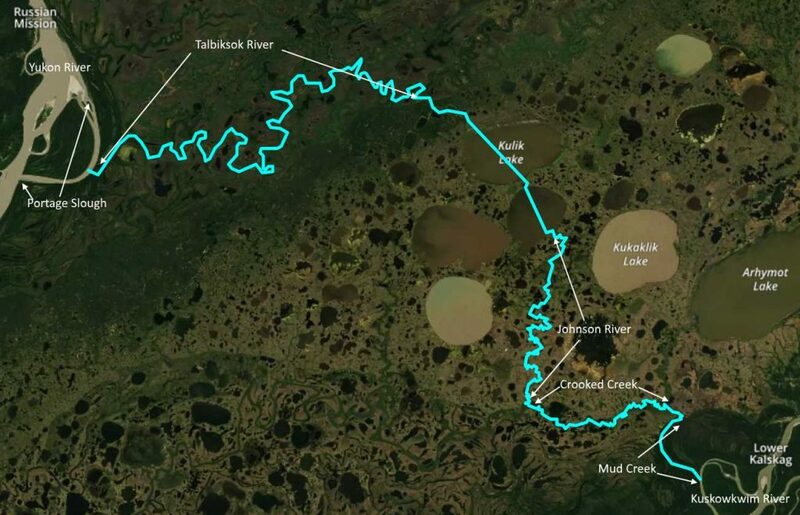 Maybe the reason these local hunters aren’t using this portage route is because Mud Creek no longer runs into the Kuskokwim River? What if it’s a dry oxbow now, and I end up miles from the Kuskokwim? I pick up my fully loaded drybag/backpack and use my inReach to get a bearing on the old portage route. I spot what looks to be an old route-marking pole, and then another a few hundreds yards farther, and then a third. After a long, tiring hike across soft ground I stumble onto an old path on firm ground. I happily follow a couple hundred yards to a small lake, which I recognize from the maps. I leave the path and walk through tall grass and trees and brush for a few hundred yards, then cross a small swamp. At last I stand at the edge of Mud Creek, clear and deep and calm. I can see that considerable water ran through here in the spring. I’m confident I can paddle all the way to Bethel from here. Yes! I take a shortcut through the trees on my way back to the kayak. Half hidden in the grass and leaves is a section of old tramway tracks.. I didn’t even know there had been a tram here! I suspect someone has hauled the rest of the rails away for some other use. 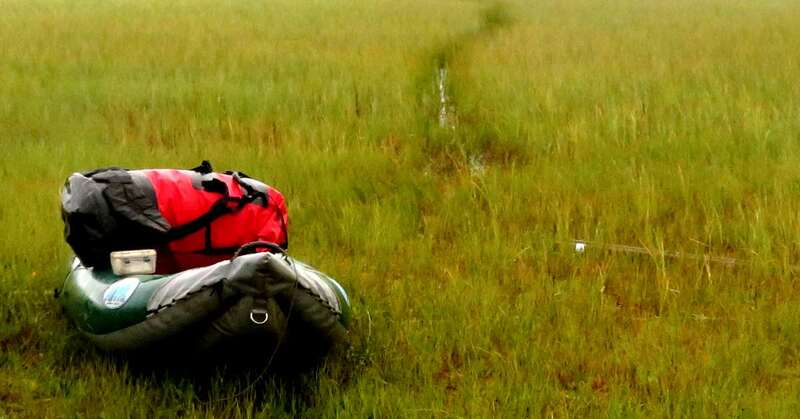 On my third and final load I deflate and roll up my kayak and put it, and my remaining gear, into my pack and make the long, spongy walk to Mud Creek. It’s about 10 PM. It’s been a hard day, including the long paddle up the creek and about five miles of walking on the portage. I set up my tent in a marginal spot in tall grass, trying to avoid rose bushes, with swarms of gnats after me and a light rain falling. It’s nothing compared to the satisfaction and relief of knowing that I’ve completed the Y-K Portage. Tomorrow I’ll start the home stretch of this adventure. Check back for the next post!